Guitar Gems – Learn How to Play the Guitar Today! Is Age a Factor When It Comes to Playing Guitar? It isn’t easy to find guitar lessons that aren’t geared toward naive teenagers. This is due to the fact that, while guitar is an ageless hobby, most guitarists begin young. They also know that young people are more prone to influence than adults. Adults scrutinize products before they buy them. Teens and kids tend to buy whichever product their idols endorse, or whichever product makes the most outrageous claims and has the flashiest site, sponsoring, and ad. With all of these things in consideration, finding guitar lessons geared towards anyone past the age of thirty is extremely difficult. In this article, instead of suggesting a slew of products, we’ll give you some tips to get started on your own. Not only will it be cheaper, but you will have less to worry about when it comes to advertisements and claims. That is, if you already own a guitar. If you don’t, then you will need to buy one of those too. 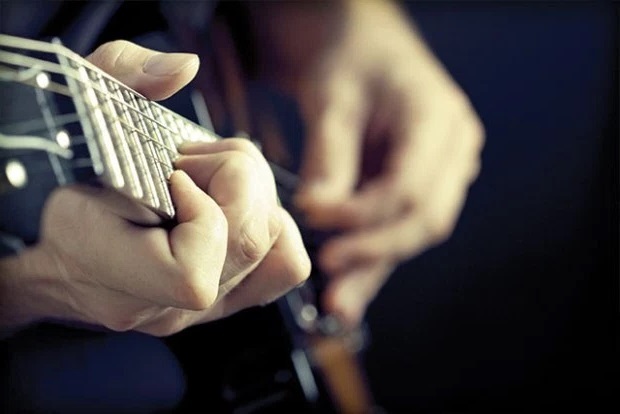 Picks are essential if you aren’t planning on playing finger style. Choose the pick gauge that feels most comfortable to you. You can either buy one or use a digital metronome. Playing along with a metronome will allow you to develop a steady sense of rhythm. This translates into playing songs the way they were meant to be played. Without steady rhythm, you will find it difficult to play along to even the simplest of recordings. Practice working with a metronome; each click is equivalent to one beat. Four clicks equals one full 4/4 measure. Be sure to start all songs off at a slow tempo when learning. Begin practicing them around 60bpm. This will allow your fingers to learn the pattern of the notes. Once you are comfortable with your guitar and you have practiced along with a metronome to the point that you feel confident, the next step is to start learning. The best place to start is a book. Unlike a video, you won’t need to rewind books over and over again to go over a lick or a scale. Musical instructional books are some of the best tools for baby boomers looking to learn their favorite songs. One of the best overall instructional books on the market is Learn to Play the Guitar by Phil Capone. The book is easy to use and is packed full of techniques that will make you a more efficient guitarist. If you are serious about learning to play the guitar, it is the best place to start. It will walk you through the beginner stages and well into the intermediate stages of guitar. To help you get started for free, GuitarPlayerWorld.com also offers an ebook which you can download for free by signing up to our newsletter. In the end, the best thing that you can do is practice. We all know the importance of dedication, and guitar is no exception. The more effort you put in, the more you will get out.